The King Cake is a traditional New Orleans cake eaten on Mardi Gras: find out how to prepare it with Novacart baking molds. Tired of the usual Carnival sweets? 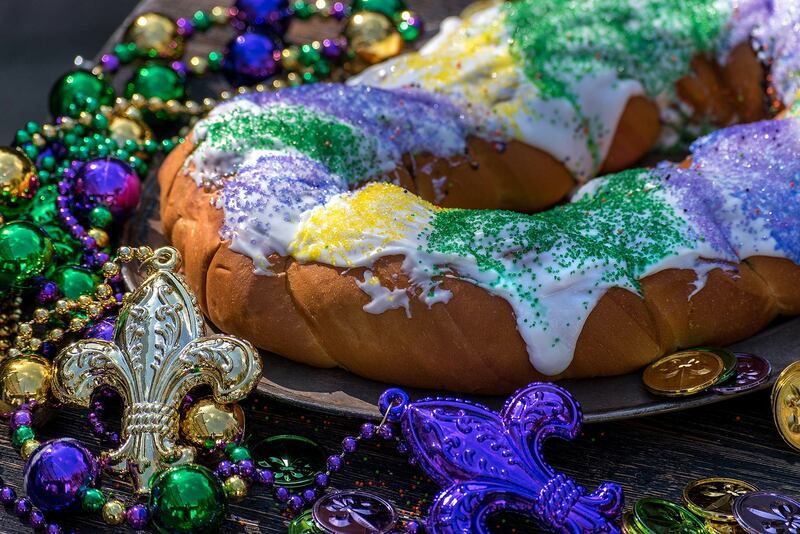 It's time to try the King Cake, a colorful ring cake that comes from New Orleans, where it is consumed on Mardi Gras. Here's how to cook it with a quick and easy recipe. Pour the flour, crushed yeast, nutmeg, salt, lemon zest and sugar into the mixing bowl. Start to knead the dough with a hook and add the egg yolks and milk. Leave the kneader in action until a homogeneous amalgam is obtained. Then add the pieces of softened butter one at a time, making sure that they mix well. After allowing the kneader to work for another five minutes, form a ball with the dough and place it on a lightly floured surface to even out the mixture with your hands one last time. Sprinkle a bowl of butter and place the ball of dough inside, on which you will still pass some butter. Cover the bowl with a transparent film and let the dough rise for an hour and a half. Meanwhile, butter Novacart ring baking mold. Once the dough is ready, deflate the dough with your hands and spread it on a level with a rolling pin, making sure that the longer side corresponds to the circumference of the ring cake. Cover the dough with cinnamon, then roll it up from the longest side. Twist the roll and arrange it in the mold by joining the two ends. Cover the mold with a transparent film and let it rise for another 45 minutes. Meanwhile, heat the oven to 190 ° C and cover the cake with the egg beaten with a teaspoon of milk. Put the cake in the oven for 35 minutes, placing it in the central part. Once cooked, strain the cake and let it rest on a grill until it is cold. In the meantime prepare the colored sugar by pouring 5 oz of sugar into three basins adding the three different colors. Then pour the colored sugar on sheets of baking paper and let it sit until it dries. Prepare the glaze by mixing sugar and lemon juice until a homogeneous mixture is obtained. Pour the frosting onto the donut. Then distribute the colored sugar to spots of alternating colors on the cake. If the sugar has solidified, break it with your hands. Novacart MBC 200 H 60 ring cake baking mold is made of pure cellulose microwave paper. Suitable for 750 g of product, it is resistant to food fats and able to withstand cooking in the oven up to 220 ° C.
In addition, Novacart ring cake mold is recyclable and has a self-supporting structure that makes the use of other preformed metal molds superfluous. Brown, with gold floral print, it is suitable both for cooking and for the presentation of the finished cake.